GH3R-289 | Size: 50 ml / 1.69 fl.oz. A powerfull, well tolerated Retinol moisturizer that dramatically regenerates the skin, improves the look of wrinkles, hyperpigmentation, texture, and skintone. 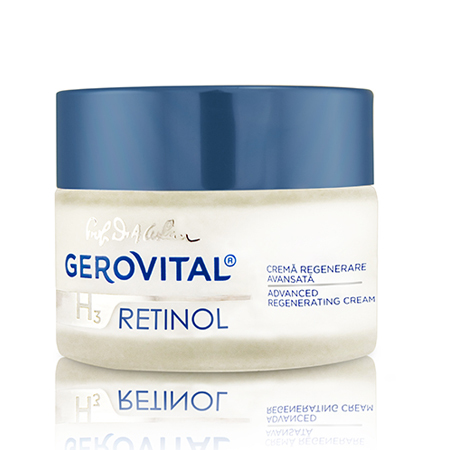 It contains Retinol Molecular Film, a formula that preserves optimal Retinol stability, enhances skin absorption of Vitamin A through the epidermis and minimizes irritation commonly associated with the use of retinoids. It helps in cases of mild to moderate acne. Scientifically developed to aim the results of wrinkles filling injections, it normalizes the cellular repair processes slowing the physiological aging of the skin. Plumping effect is enhanced by the association with Sepilift Complex (diminishes wrinkles, increases skin elasticity and firmness), Biomimetic Natural Oils (Soybean, Squalane, Shea Butter) and Boswellia Serrata Extract (soothes, regenerates and prevents possible skin irritation). • Skin firmness increased up to 65.7%. INGREDIENTS: AQUA, GLYCINE SOJA OIL, CETEARYL ALCOHOL, CETEARETH-22, GLYCERIN, DIMETHICONE, ETHYLHEXYL COCOATE, DIMETHICONOL, TOCOPHEROL, RETINOL, DIMETHYLMETHOXY CHROMANOL, GLYCERYL STEARATE, SQUALANE, BUTYROSPERMUM PARKII BUTTER, DIPALMITOYL HYDROXYPROLINE, PHENOXYETHANOL, ETHYLHEXYLGLYCERIN, POLYACRYLAMIDE, C13-C14 ISOPARAFFIN, LAURETH-7, DIPROPYLENE GLYCOL, BOSWELLIA SERRATA RESIN EXTRACT, TOCOPHERYL ACETATE, RETINYL PALMITATE, HELIANTHUS ANNUUS (SUNFLOWER) SEED OIL, PARFUM, TETRASODIUM EDTA, SODIUM HYDROXIDE, BHA, BHT. I used this cream my skin was so traveled,rnAmazing!!! rnMy skin well soon, the cream helped my face thanks!